In short, chronic stress impacts the immune system. When the immune system is weak, you’re more susceptible to infections. Severe and prolonged infections create chemical changes in the brain, which, over time, can contribute to dementia. 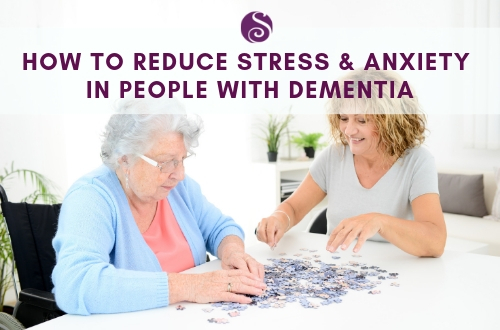 That’s why managing stress is so important for both those with dementia and their caregivers. If your loved one is living with a dementia like Alzheimer’s, there are ways you can help manage their stress. These triggers can also fluctuate. For example, something that bothers them during the day may not bother them at night, and this week’s trigger may not be an issue next week. Of course, avoiding these triggers is a proactive way to prevent stressful situations, but what else can you do to reduce stress in your loved one? The key to addressing behaviors related to stress and anxiety in someone with a dementia like Alzheimer’s is distraction or redirection. If your loved one is anxious or irritable, redirecting their attention and re-engaging them with another activity will help get them out of that rut. Engaging in light exercise is a great way to “work out” stress, especially outdoors in a place like Florida. Activities such as walking, gardening, swimming or dancing are all helpful outlets. Plus, this physical activity can also help them sleep better at night. A great way to redirect attention is listening to music. Not only can music improve the mood of someone with dementia, but listening through headphones can help them block out triggers or stimuli that may be causing stress. Is there an activity or hobby your loved one enjoyed before their diagnosis? That may be a good first step to manage their anxiety, but recognize that there’s a fine line between that activity being helpful and making the situation worse. The solution? Take baby steps. For example, if cooking was a favorite activity, start by giving them small tasks — such as getting out the measuring cups — and judge how they handle it. Often times, people with dementia can become frustrated (and more stressed) when they can’t do something they used to enjoy. That’s why it’s crucial to start slow and adapt to their feelings and abilities. Board games and playing cards can also be a double-edged sword. While they can serve as stress-relieving distractions, it’s important to choose games that aren’t highly structured and don’t have many rules. Simple games like matching card games or certain types of bingo are good options. At Serenades by Sonata, a specialized memory care community in Florida, checkers games are openly available to residents, and they’re free to interact with them as they please. They don’t actually play by the rules, but just being able to pick up the pieces and move them around is comforting and fosters independence. These activities are another great form of distraction that can help manage anxiety, but remember to set them up for success by giving them tasks they can accomplish — not ones that are too challenging. April is National Stress Awareness Month, and there’s no better time to consider the best ways to manage your loved one’s stress — and yours. 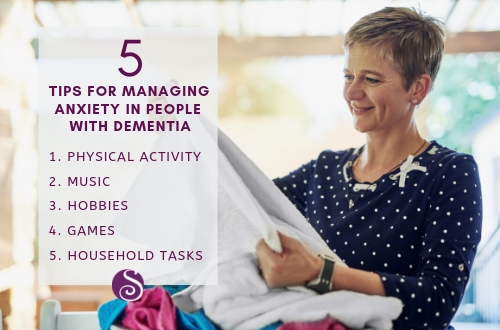 Determining the best stress-reducing activities for someone with dementia is often a process of elimination, requiring (sometimes difficult) trial and error. This is easier for a professional care partner, because unlike a family member, they won’t take aggressive behaviors personally. 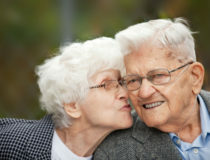 A professional memory care center can also offer other amenities that help manage stress. The experts at Serenades by Sonata in Florida allow residents total access to secured outdoor areas, since locked doors are a major source of frustration for those with dementia. Residents also have the freedom to move around and pick up decor and knick knacks, which is a source of comfort. At the end of the day, managing stress is about creating that comfortable environment for your loved one. That looks different for everyone, but the first step is paying attention to what they need.